The Sariska Tiger Reserve is a renowned Wildlife Sanctuary situated among the Aravalli hills in the Alwar district of Rajasthan state. One of the most visited parks in India - Sariska National Park was declared a wildlife sanctuary in 1958 and came under the "Project Tiger" as a tiger reserve in 1979. Tourists flock to the reserve in large numbers as the region is easily accessible from major cities like Delhi and Jaipur. 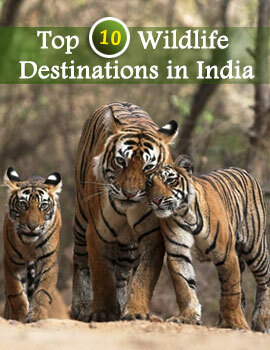 Sariska Tiger Reserve, Rajasthan occupies a total area of about 800 sq. km, with the core area being approximately 500 sq. km. The Northern Aravali Hills form an enchanting backdrop, featuring sharp cliffs and long valleys. The abundant occurrence of a wide variety of wildlife at Sariska Tiger Reserve, Rajasthan is an excellent example of ecological adoption and tolerance, for the climate here is variable and erratic. 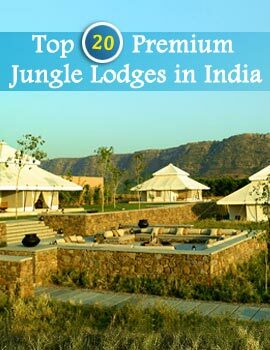 Sariska is prime tiger country, with the terrain chiefly comprising of undulating plateau lands and wide valleys. The topography of Sariska Tiger Reserve, Rajasthan supports scrub-thorn arid forests, dry deciduous forests, rocks and grasses. The flora growing at the park includes Dhok - found predominantly in the region, Bamboo, Boswellia serreta, Lannea coromandelica, Kattha and a host of other varieties. Besides tiger, the Sariska Tiger Reserve, Rajasthan is home to an enchanting variety of fauna, namely Spotted Deer, Sambar, Blue Bull, Tiger, Leopard, Caracal, Rusty Spotted Cat, Jungle Cat, Four-horned Antelope, Wild Boar, Jackal, Hyena, and others. Sariska is also well known as the habitat of Rhesus Monkeys, which are commonly found around Talvriksh. Avifauna at Sariska park include Peafowl, Grey Partridge, Bush Quail, Sand Grouse, Tree Pie, Golden backed Woodpecker, crested Serpent Eagle and The Great Indian horned Owl. During mornings and evenings, the wild beasts in Sariska Tiger Reserve are known to head towards the numerous water holes lying scattered throughout the park. These times provide the best chances for visitors to spot rare wildlife from close quarters. By Air:- The nearest Airport is at Jaipur (180 km). By Rail:- The nearest Rail Junction is at Alwar, about 35 km from Sariska. Buses and taxi are available from here to reach Sariska. By Road:- Direct buses are available from Delhi and Jaipur to reach Sariska via Alwar.